Washington, D.C. — Four decades ago — in the mid-1970s — U.S. and Iranian officials haggled over a range of concerns that uncannily prefigured similar clashes that surfaced prior to today’s history-making nuclear accord between the P5+1 governments and Iran, according to documents posted today by the National Security Archive at www.nsarchive.org. The documents from the 1970s record the Shah of Iran’s insistence that his country had “rights” under the Nuclear Nonproliferation Treaty (NPT) to develop such a program. The Shah further claimed his interest was only in peaceful activities, and cited among other justifications the need to be able to compensate for the eventual decline in Iran’s oil reserves. The current Iranian government, whose predecessors overthrew the Shah in 1979, has propounded the same arguments. For their part, Obama administration officials have expressed concerns — echoed far more sharply by opponents of a deal — about the threat of proliferation inherent in any agreement that allows Iran to develop nuclear energy resources. Doubts have also sprung up from many quarters in recent years that Tehran’s aims are purely peaceful, and skepticism is even more rife about the Islamic Republic’s claim that it needs to address the fact that its oil resources are finite. As during the Ford and Carter years, worries about nuclear weapons being available for supporting terrorism have hampered the current talks. Of course there are differences between “then and now.” For instance, in the 1970s the U.S. and many other countries objected to Iran having any capability to produce either plutonium or highly enriched uranium whereas in the current era Iran’s abilities in the latter regard are an established fact. The political picture is also vastly different. The U.S. and Iranian governments have been bitter enemies since 1979, in contrast to the close ties that existed between Washington and the Shah. Despite the basic differences between the two sides, and the degree of mistrust that has characterized their relations, Iran and its negotiating partners managed to reach fundamental nuclear accords in the 1970s — under both a Republican and a Democratic U.S. president, respectively — as well as now in 2015. In the earlier case, the 1979 revolution intervened before the agreement could be signed. Today’s accord still requires congressional approval, among other steps, before it enters into force. But the parallels after so many years and despite the disparity in political outlook inside Iran, then and now, are intriguing. Today’s posting draws heavily on previous National Security Archive electronic publications compiled and edited by William Burr whose archival research and Freedom of Information Act / Mandatory Declassification Review requests over the years have steadily broken new ground on this critical subject. The descriptions for the 1970s documents below are edited versions of material produced by Dr. Burr. For purposes of comparison and permanent access, this posting also includes the text of the July 14, 2015, Iran – P5+1 agreement and official remarks by President Barack Obama, Secretary of State John Kerry, and Energy Secretary Ernest Moniz. These memoranda provide a sense of the concerns that shaped the U.S. position throughout the nuclear negotiations with Iran. Not only did Defense Department officials observe that the nuclear power plants sought by the Shah would provide a capability to produce hundreds of nuclear weapons, Department of State officials worried that should the Shah’s dictatorship collapse and Iran became unstable, “domestic dissidents or foreign terrorists might easily be able to seize any special nuclear material stored in Iran for use in bombs.” Moreover, “an aggressive successor to the Shah might consider nuclear weapons the final item needed to establish Iran’s complete military dominance of the region.” It was those concerns that made the Ford administration seek special controls to ensure that U.S.-supplied nuclear materials in Iran were safeguarded for peaceful uses only. Other Ford administration priorities, including an ongoing interagency nuclear proliferation policy review, temporarily put the pending Iranian nuclear deal on the backburner. The policy review reproduced here, completed in early December 1974, recommended an “intensified program to inhibit the further spread of independent nuclear explosives capabilities.” Worried that inhibitions to nuclear proliferation and security guarantees were weakening, the NSC Under Secretaries recognized that it might be possible only to delay proliferation, but that even a “partially effective strategy” could serve U.S. national security policy. Any action taken, however, had to be cooperative because the United States was beginning to lose its dominant position as a nuclear exporter. Source: Digital National Security Archive, Presidential Directives on National Security, Part II: From Harry Truman to George W. Bush, Jeffrey Richelson, editor. While Henry Kissinger already had signed off on a policy position, the Iranian deal had to go through a major review so that it would have the support of all relevant agencies. 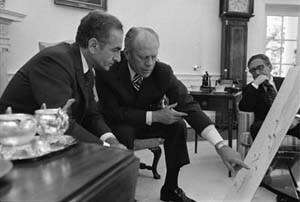 During early Spring 1975, before the Shah’s scheduled visit to the United States in May, the agencies considered possible approaches to the reactor sale, trying to secure an optimal balance between proliferation “principles and objectives” and such goals as export business and good relations with the Shah. After reviewing a number of options, ranging from a veto over reprocessing to allowing Iran to “perform reprocessing” with adequate safeguards, the White House issued this National Security Decision Memorandum. While Kissinger took a flexible position on fuel supply issues, the initial negotiating position on reprocessing would be hard: “Continue to require U.S. approval for reprocessing of U.S. supplied fuel,” with the establishment of a multinational reprocessing facility an “important factor” for securing such approval. For a fallback position, the U.S. would approve reprocessing in Iran so long as the supplier of technology and equipment was a “full and active participation in the plant,” with the possibility of U.S. participation to be held “open.” As long as the U.S. was able to ensure additional safeguards, the possibility of a binational option was generally consistent with Richard Helms’ advice that Washington work for a tacit veto by acquiring “a voice in management decisions” in a reprocessing plant. In June 1977, a new ambassador, career foreign service officer William Sullivan, arrived in Tehran, presenting his credentials to the Shah on 18 June. During their meeting, the Shah told Sullivan that he was ready to resume the nuclear power negotiations and expressed hope that the reactors would be sold. As Sullivan explained in his cable, he did not follow up on the Shah’s observations because he wanted the Iranians to “put all their cards on the table” before using the guidance that President Carter had given him. Sullivan did not want to “look too eager” (a charge leveled against the Obama administration by some critics in 2015). The Shah’s “specific disavowal of interest in reprocessing plant” met with a skeptical response from the cartoonist at ISA’s Iran desk who drew a small picture of a bull next to those words. This is the full text of the 159-page joint agreement of July 14, 2015, as posted on the Russian Foreign Ministry’s web site (from which most media appear to have retrieved the document). Energy Secretary Moniz became a key member of the U.S. negotiating team in Vienna. A theoretical physicist by training, he served as both an expert and a political shield against those inclined to criticize the talks for lacking seriousness.